Update 15.08.2018: Amazon regularly adjusts rules for backend keywords. We have updated this post to reflect current changes. First published April 2017. In this article, we will walk you through keyword optimization in Amazon Seller Central step by step. How Are Amazon Search Terms Used in Seller Central? Products on Amazon can only be found via search if they contain all of the search terms a user enters in a search query. Keyword optimization for Amazon is much different than for other search engines. To make sure your products are listed for as many keyword combinations as possible, you need to equip them with a lot of relevant search terms. This is where Amazon’s backend search fields come in handy: Use them to include all the keywords that are relevant, but didn’t quite fit in the title or bullet points. This is also a good place to put keyword variations that aren’t suitable for visible integration, like colloquial synonyms or common misspellings of certain keywords. Amazon has once again changed the character restrictions for Seller Central backend search fields. As of August 2018, Amazon is only indexing 249 characters in the backend search fields. Additionally, spaces, commas and hyphens are now included into the character count. 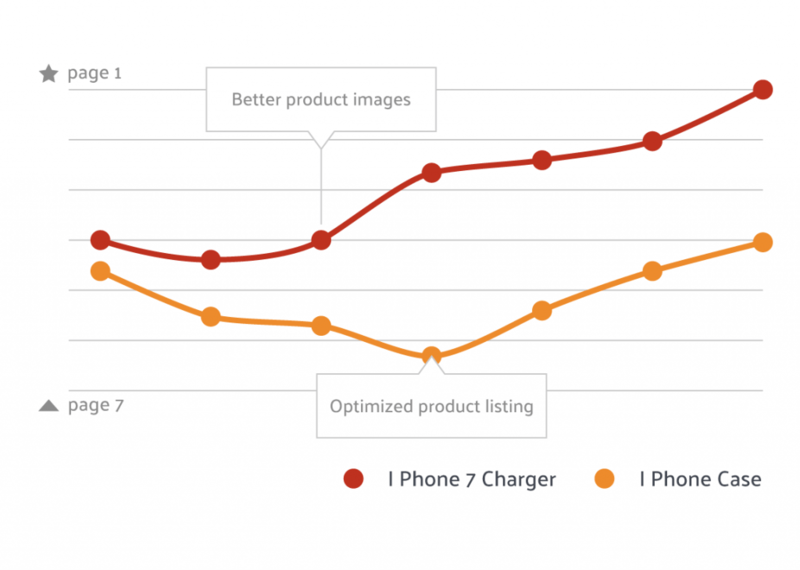 We’ve seen Amazon roll out these changes incrementally, however sellers should be proactive and readjust their backend keywords immediately in light of these changes. Prioritize and drill down to a list of the most relevant keywords for your product. Amazon treats the entire field as a coherent set of keywords, so keyword location or relative distance of keywords from one another is irrelevant. So to cover different combinations of keywords (e.g. “cream face” and “cream eyes”), it’s not necessary to repeat any keywords. Therefore, you should aim to enter as many unique keywords per field as you can. Here are some tips to help you save space when entering Amazon search terms into the back end of Seller Central. Even cutting down on a few characters will allow you to add some extra terms! Avoid repetitions by using hyphenated keywords: Two words connected by a hyphen cover all possible combinations and the individual words at the same time. For instance, the keyword “anti-aging” covers “anti”, “aging”, “anti-aging”, “anti aging” and “antiaging”. Furthermore, you don’t have to distinguish between singular and plural forms as both will be included in the search automatically. Likewise, there is no distinction between upper and lower case letters. Filler words and stop words are also omitted in the search and should thus be left out. Exclamation points should by all means be avoided as they cause a product to only be listed if a search query exactly matches the queried phrase. And finally, to separate keywords you should just use single spaces – commas are not required and just take up valuable character space. The following examples illustrate a bad and a good implementation of filling the Amazon search term fields in Seller Central backend. 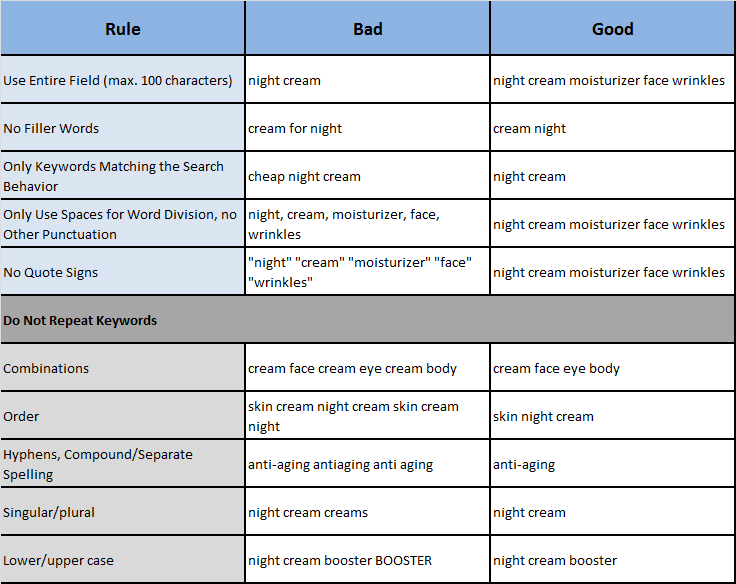 The aim is to achieve optimal keyword coverage for a night cream. In this example, not all keywords are taken into account by Amazon for the reasons indicated earlier. Moreover, space for keywords is unnecessarily occupied and not wisely used. The night cream is available for fewer queries than what would have been possible! In this example, all relevant search terms (keywords) are considered by Amazon. The space is utilized effectively so that more keywords are covered and the night cream will show up in many more search queries – therefore increasing that product’s visibility on Amazon. A higher visibility most always results in a higher amount of clicks. Find new keywords, compare Amazon search volume data, track keyword rankings, and much more with our complete Amazon SEO tool.